NOW AVAILABLE IMMEDIATELY, new dress has arrived from Gavin. 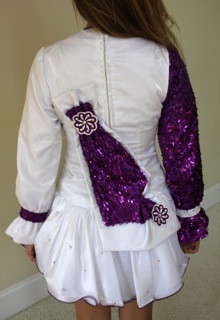 Beautiful, one of a kind Siopa Rince worn by a very tall U13 open championship dancer. 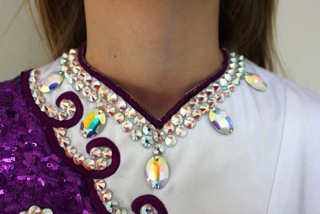 Very lucky dress! Worn a handful of times. Has received countless compliments. In great condition stored flat in a smoke free and pet free home. 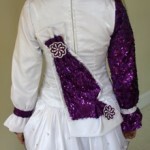 Made out of white twinkle satin and purple sequins, with Siopa Rince’s signature cuffed sleeves. Lined with cotton lining on the inside for extra comfort. Has over 800 crystals. 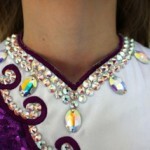 Swarovski AB crystals ranging in sizes from 20ss-40ss and 9 sew-on flatback ovals. 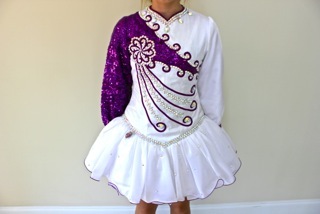 Includes purple satin bloomers. Asking Price: $975 USD OBO. Shipping and returns are negotiable.